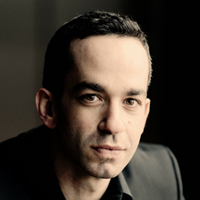 “One of the most admired pianists of his generation” (The New York Times), Inon Barnatan is celebrated for his poetic sensibility, musical intelligence, and consummate artistry. He was a recipient of Lincoln Center’s Martin E. Segal Award in 2015, recognizing “young artists of exceptional accomplishment,” as well as the prestigious Avery Fisher Career Grant in 2009. This year he embarks on his third and final season as the inaugural artist-in-association of the New York Philharmonic, in which capacity he played Beethoven’s first piano concerto under the baton of Manfred Honeck. Barnatan also collaborates with Philharmonic Music Director Alan Gilbert, who calls him “the complete artist: a wonderful pianist, a probing intellect, passionately committed, and a capable contemporary music pianist as well.” The two perform Beethoven’s second concerto this season for Barnatan’s Leipzig Gewandhaus Orchestra debut after joining forces in recent months with the Academy of St Martin in the Fields to record that orchestra’s first complete Beethoven concerto cycle on disc. The pianist opened his 2016-17 season playing and leading Mozart’s Concerto No. 13 with San Francisco’s New Century Chamber Orchestra, followed by a packed schedule that includes debuts with the Chicago, Baltimore, Seattle, Nashville, San Diego, and Fort Worth symphony orchestras and returns to many orchestras and venues around the U.S. He also makes his debut with the Hong Kong Philharmonic under Jaap Van Zweden and his Australian debut with the Queensland Symphony, returns to Tokyo with the Tokyo Metropolitan Orchestra, and performs the complete Beethoven piano concerto cycle in Marseilles.